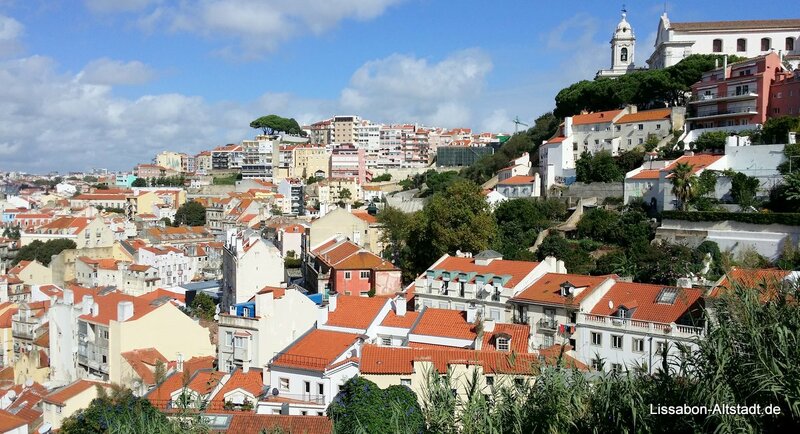 Dominated atop the hill by the imposing medieval Castelo São Jorge, the two neighbourhoods of Alfama and São Vicente are the oldest districts of Lisbon. Steeped in history, the narrow, winding streets climb upwards to 800 year old castle. The whole area is home to some of the oldest and most beautiful sights of the city, not to mention ancient churches and museums. The Miradoura de Santa Luzia and Miradoura de Santa Catarina have two of the most breathtaking views of the city and the river. 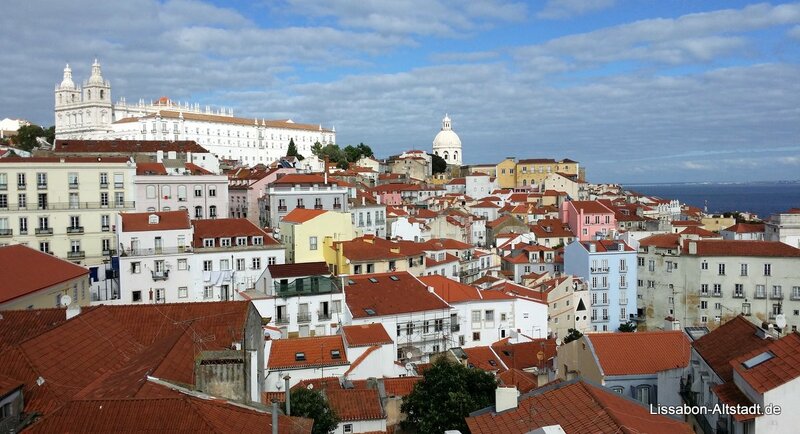 The views from the Castelo Sao Jorge are equally as stunning. 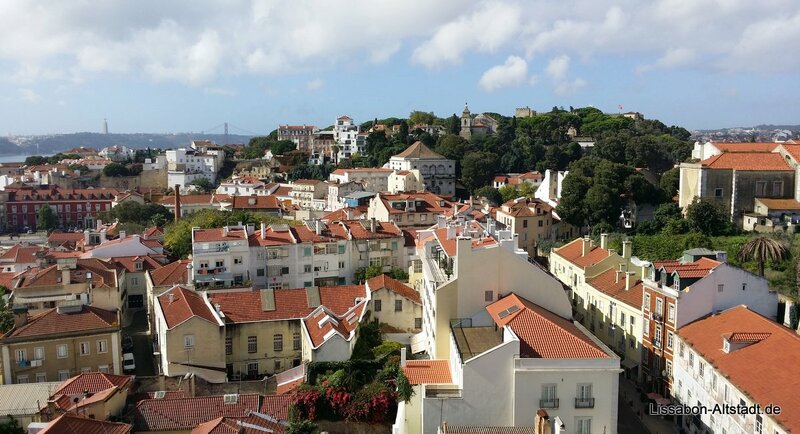 Our Apartments, situated in an old townhouse, are right in middle of this amazing part of Lisbon. Just wandering around the streets, squares and alleyways, with their tiny shops, workshops, cafés bars and restaurants. 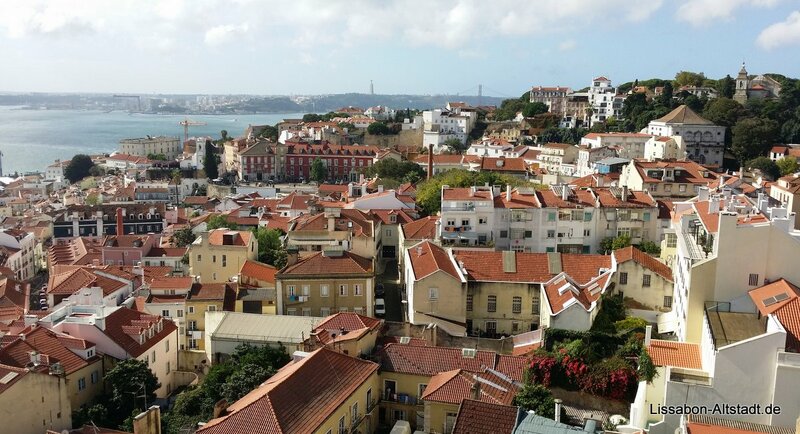 will give you a real feeling of being in Old Lisbon. 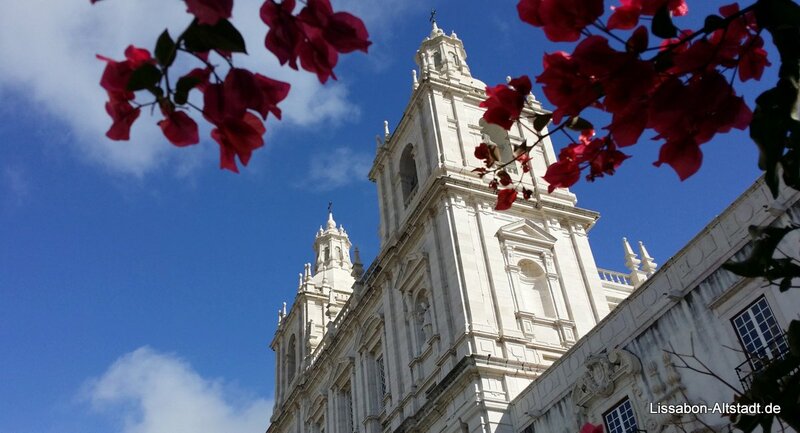 The historic renaissance monastery of Sao Vicente de Fora is almost on the doorstep of our townhouse. Just behind monastery is the Ladra Flea-market (Tues & Sat). Also close by is the baroque church of Santa Engraçia, Lisbon’s largest church. A wander through the Flea-market leads you to the Se, the ancient cathedral of Lisbon. For those who prefer riding to walking then an ideal way to tour the district is by taking the No. 12 or 28 tram as they climb the hills along impossibly narrow streets and even narrower, tight bends. The downhill trip is as good as any white-knuckle ride! A fantastic open air café is located in front of Graca church. 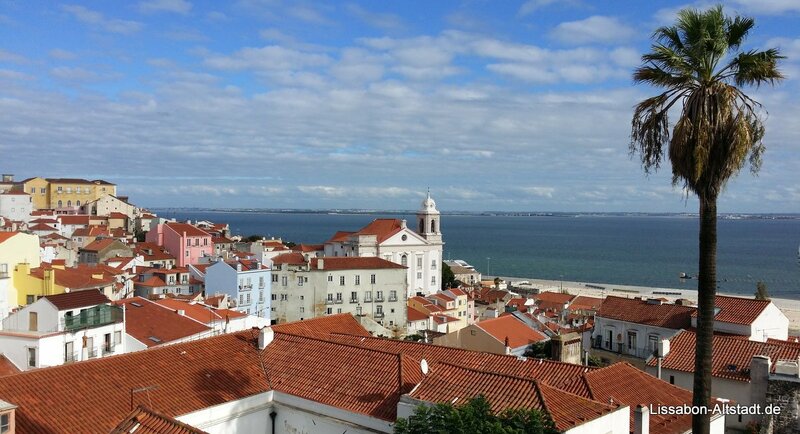 Little snacks and the most impressive sunrise and sunset location in Lisbon awaits you. The historic market hall located at Campo de Santa Clara offers every Tuesday and Saturday, during the fleamarket Feira da Ladra, delicious lunches. Please visit also the trendy design shops around the historic market hall. 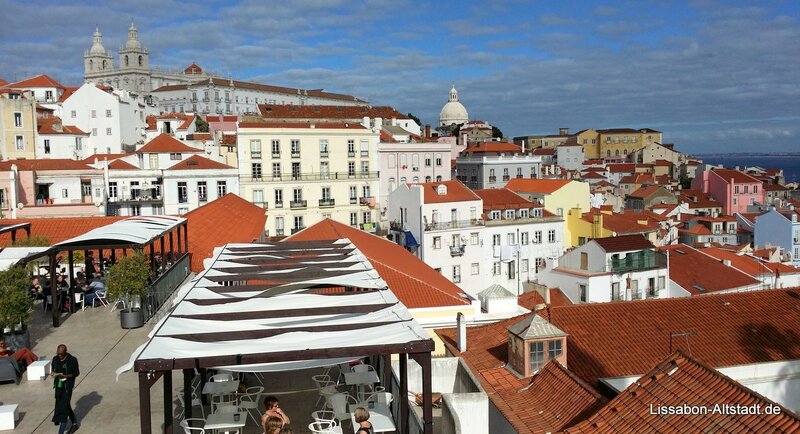 The trendy restaurant Vinho sem Principio, located in the western part of Alfama almost on the riverside, offers a wide range of portuguese wines and delicious dishes. Faz Figura at Rua do Paraiso is an elegant and high-standard evening restaurant that offers a stunning view to the Tagus estuary from its winter garden. We recommend you to allocate a table in advance. If you want to listen to Fado, we recommend Parreirinha de Alfama, a very authentic Fado spot located above the museum of Fado. It entertains locals and visitors with its big variety of artists and authentic food. The fastest and most convenient way is to take a taxi but we strongly recommend that you negotiate the price before you set off. It costs around €15. From the airport you can take the metro until Santa Apolonia station. Alternatively, take the Aerobus dircectly to Rossio, and walk (about 10-15mins) across the square to the Lg. S. Domingo and along the Rua D. Duarte to the tram terminus in the square at Martim Moniz. From there take the No.28 tram to the Sao Vicente monastery. 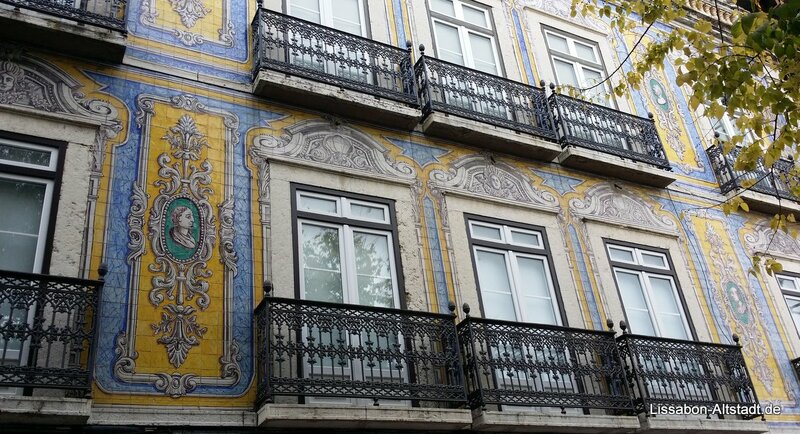 The townhouse is in the Rua de São Vicente, about 50m from the tram stop. The total cost is around €4-5.